The ornithodirans are defined as the group containing the common ancestor of the pterosaurs and dinosaurs and all of its descendants. By the Early Jurassic Epoch, the ornithodirans were well on the way to becoming the dominant terrestrial vertebrates of the Mesozoic. Without the dinosaurs, the so-called "Age of Reptiles" may have become something entirely different—perhaps even an age of mammals. As the natural history of the Mesozoic Era unfolded, however, mammals continued to develop in the shadows of the dinosaurs until the course of evolution and a horrendous mass extinction removed the dinosaurs and pterosaurs from the picture, 65.5 million years ago. From the Late Triassic, when the earliest dinosaurs (as well as the first true mammals) first appeared, to the end of the Cretaceous Period, when they unceremoniously perished, dinosaurs and their closest kin ruled the planet. This rule lasted an astounding 162.5 million years and greatly influenced the course of evolution for other animals as well. It is appropriate to take a closer look at the anatomy of the dinosaurs before delving into their origins and earliest representatives, the story of which occupies much of the rest of this book. As their namesake, "bird necks," suggests, one of these skeletal features is an S-curved or flexible neck. Other common features joining the pterosaurs and dinosaurs include an upright gait, a hingelike ankle joint, and the elongation and strengthening of the middle three toes on the hind limbs so that these animals could walk on them, rather than on the soles of the feet like other reptiles and many mammals. Birds, the living descendants of dinosaurs, share these same characteristics. Tyrannosaurus rex is arguably the best known dinosaur among the nonscientists of the world. It can be safely stated that the average six-year-old child knows more about Tyrannosaurus than he or she does about the president of the United States, the African lion, or the kinds of trees that grow in his or her neighborhood. The names of several other dinosaurs are almost equally familiar: Triceratops, Apatosaurus, Stegosaurus, Ankylosaurus, Maiasaura, and Velocirap-tor are among them. Ask any adult or child if he or she knows what a dinosaur is, and that person will answer with a confident yes. Despite most people's familiarity with dinosaurs, there is much confusion over what a dinosaur is not. A dinosaur is not a waterdwelling animal, so plesiosaurs, mosasaurs, ichthyosaurs, and other monstrous marine reptiles do not qualify, despite the fact that they lived at the same time as dinosaurs. A dinosaur is not a flying animal, so pterosaurs, although closely related, are not dinosaurs. Picture books from one's youth may have confused dinosaurs with several other extinct vertebrates from entirely different times. The sail-backed Dimetrodon was a synapsid pelycosaur that lived long before the dinosaurs. Dimetrodon is more closely related to mammals than to dinosaurs. The wooly mammoth, though large and possibly cantankerous, is a mammal that lived at the same time as cave-dwelling humans, as recently as 10,000 years ago; it is not a dinosaur and it did not live alongside dinosaurs. • An expanded ilium, the uppermost bone of the pelvis that is connected to the hip vertebrae, which contributed to the upright stance of the hind limbs. • A distinct ball-and-socket structure connecting the upper leg bone (femur) with the hip joint; this made possible the upright stance of the hind limbs. • Three or more fused sacral vertebrae, located just above the pelvis, that provided a strong, solid connection of the pelvic girdle to the hip vertebrae. • A backward-facing shoulder joint that ensured an upright posture for the forelimbs. • An elongated shelf or crest on the front edge of the upper bone of the forelimb (humerus) for the attachment of muscles. • Three or fewer bones in the fourth finger of the forelimb. Many of the special traits of dinosaurs are related to the development of an upright walking stance in which the legs fully support the weight of the body. Modifications to the shoulder girdle, forelimbs, hands, pelvic girdle, hind limbs, and feet all contributed to the improved mobility of dinosaurs and suggest that they had a more active, energetic lifestyle than did other kinds of reptiles. The evolution of the upright posture in dinosaurs resulted in two distinctive styles of hips. These hip structures have been recognized since the 1880s as an important consideration in understanding the relationships between different kinds of dinosaurs. Hip bones provide a point of connection to the trunk of the body for the hind limbs. The way in which bones and muscles are joined at the hip region has much to do with the posture and mobility of an animal. Hips of terrestrial animals consist of three basic parts, all of which enclose the acetabulum, or socket, to which the leg bones are connected. The broad, platterlike bone above the acetabulum is the ilium; it consists of two identical halves (ilia) connected on both sides of the spine to the fused, sacral vertebrae, as if cradling the backbone. Below the acetabulum on either side lie two longer bones known as the pubis and the ischium. The positioning of these three hip bones conforms to two general hip patterns seen in dinosaurs. In the first, called the saurischian, or "reptile" hip, the pubis points forward and the ischium points backward. In the second, called the ornithischian (or "bird" hip), both the pubis and the ischium point backward and lie parallel to one another. In the latter case, the pubis also has a forward-pointing extension called a cranial process. Note that despite its name, the ornithischian or bird-hipped dinosaurs are not the direct ancestors of birds; that distinction goes the saurischian dinosaurs, among which were meat-eating dinosaurs of all kinds and some of which later also evolved a backward-pointing pubis. Hip structures add to the anatomical features that can be used to group different kinds of dinosaurs but barely hint at the diversity within this intriguing taxon of creatures. Within the saurischian dinosaurs can be found not only all of the carnivorous kinds of dinosaurs, big and small, but also the long-necked and most gigantic of the plant-eating dinosaurs. The ornithischians include only herbivorous dinosaurs, but these vary widely, from the largely bipedal duck-billed and bone-headed dinosaurs to armor-plated, horned, and plated quadrupeds. Dinosaurs were not always considered to be a monophyletic group, or a single clade of animals descended from a common ancestor. A short history of their classification begins in 1842, when British paleontologist Richard Owen established the term Dinosauria—"terrible lizard"—to describe several puzzling specimens of extinct reptiles that previously had been described from fossils found in Great Britain and Germany. Owen recognized the animals as oversized reptiles but with limbs arranged in an upright, mammal-like posture for walking on land. Only a handful of such fossil specimens were known at the time, and all appeared to be from exceedingly large, quadrupedal animals. From the term Dinosauria comes the popular term "dinosaur." (1825-1895) and Americans Edward Drinker Cope (1840-1897) and Othniel Charles Marsh (1831-1899), attempted through classification to bring clarity to the many varied kinds of dinosaurs specimens that were being discovered. 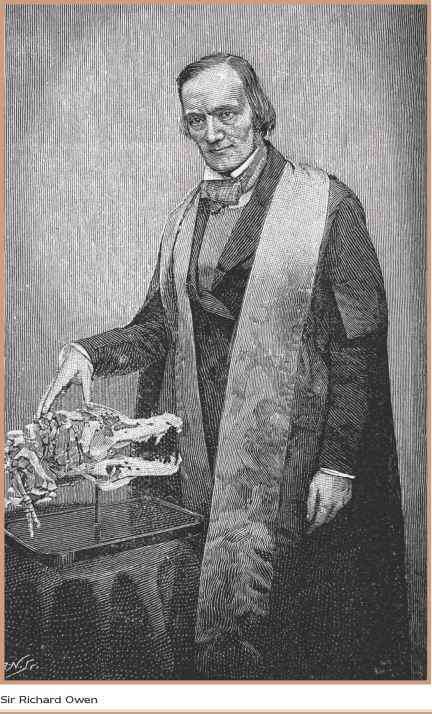 By the 1880s, enough fossil evidence of dinosaurs had been unearthed for British paleontologist Harry Govier Seeley (1839-1909) to make a key observation: Dinosaurs appeared to be divided into two subgroups based on their hip structure. In 1887, Seeley divided all dinosaurs into these two groups, which he termed the Saurischia and the Ornithischia. Precious little fossil evidence about the origin of dinosaurs was available in Seeley's time. Because of this, Seeley believed that the two lines of dinosaurs were descended from different, rather than common, ancestors. He also believed that the leading candidates for these ancestors would be among the basal archosaurs, or "the-codonts" as they were known in Seeley's day. The implication was that dinosaurs were not a natural group of animals united by a common ancestor, but that they had two origins, one associated with each style of hip. 1986 that put the dispute to rest for the time being. In this landmark work of cladistic analysis, Gauthier identified more than 10 derived anatomical features that joined saurischian and ornithischian dinosaurs into a single group. The practice of cladistic analysis has now become a well-established technique for analyzing the relationships between dinosaur groups. Computer software is commonly used to model data points in the analysis and to diagram dinosaur phylogeny, or family trees. For any current student of paleontology, the computer has become as necessary a tool for the study of dinosaurs as a rock hammer and hiking boots.